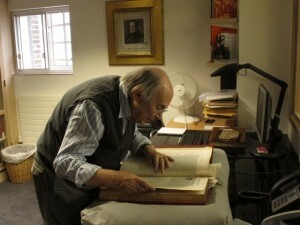 Sir Quentin examining the Sabellicus. The Incunabula Cataloguing Project Team was delighted yesterday to welcome the renowned illustrator and author Sir Quentin Blake, accompanied by art education consultant Ghislaine Kenyon, on a visit to the Library. In 2014, CUL proposes to publish an illustrated monograph containing a collection of 60 short articles penned by invited experts, discussing items from the incunabula collections. The authors have been selected to represent as wide a demographic as possible, with artists, poets, scientists and medics alongside incunabulists and typographers. The arms of the Cornaro family. Sir Quentin has very kindly agreed to contribute an article on one of our most remarkable decorated books, and visited yesterday to peruse it. 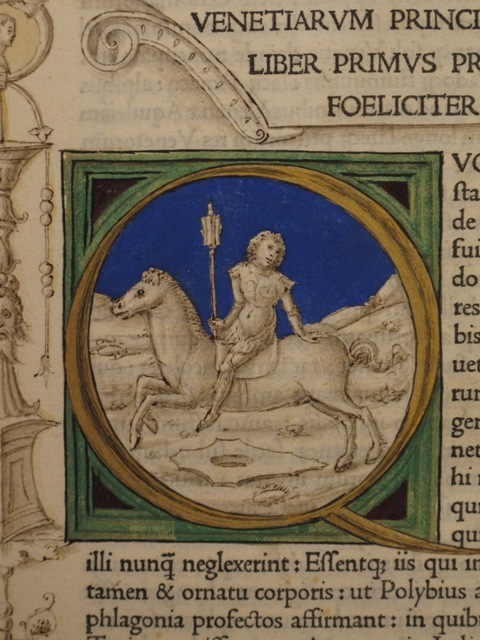 SSS.2.3 is a beautiful crisp copy of the Venice edition of Sabellicus’s Decades rerum Venetarum, printed by Andreas Torresanus, de Asula, 21 May 1487 (ISTC is00005000). 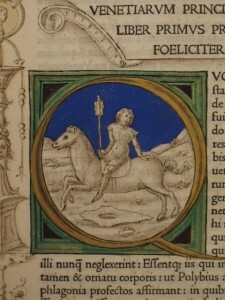 The CUL copy was clearly intended for presentation, and aimed at a patron of some standing. 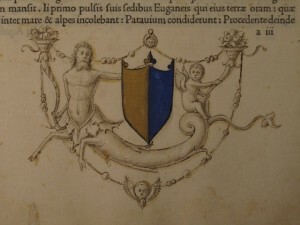 Leaf a3 recto is richly decorated with the arms of the Cornaro, one of Venice’s patrician families, held aloft by a slim triton and winged putto. There are a further thirty-five historiated faceted initials, mostly drawn in pen and set against a coloured background, depicting architectural motifs, figures and animals. These superb initials have been attributed by Lilian Armstrong to the Pico Master. 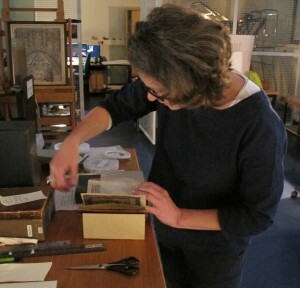 Sir Quentin spent a happy couple of hours examining the book with Laura Nuvoloni, the Project Cataloguer, and we eagerly await his submission.